An action-packed family getaway that takes you through New Zealand's North & South Islands. You will experience more than just dramatic scenery and the country's finest accommodation. This is a vacation rich in culture, education and amazing family adventures! You’ll stay 2 nights in a Two Bedroom Suite at the Heritage Auckland. Your Maori guide from the Ngati Whatua tribe will re-tell ancient and sacred stories on a walking tour through Auckland. Learn how Auckland was discovered, why it was so fiercely fought over, how the people co-existed with the land and the arrival of foreign vessels to Auckland’s shores. Experience one of New Zealand’s best tourist attractions: Kelly Tarlton's is a wonderland of snow, ice and water. The Antarctic Encounter is an experience of the wilds of the Antarctic – past, present and beyond. In the Underwater World travel deep beneath the ocean on a moving walkway. Through an acrylic tunnel, experience a scuba divers view of the ocean life surrounding you. See giant stingray glide overhead, moray eels lurking in the rocks and come face to face with predator sharks! Next enjoy a two hour sailing experience on and America’s Cup yacht in Auckland Harbour! NZL40 is a grand prix racing machine and was part of The America’s Cup challenge. You can take the helm, exert energy on the grinders or simply sit back and enjoy the action. This morning you’ll pick up your Premium 4WD and head towards Rotorua. On the way stop for a guided tour of Hobbiton - the Lord of the Rings movie set. 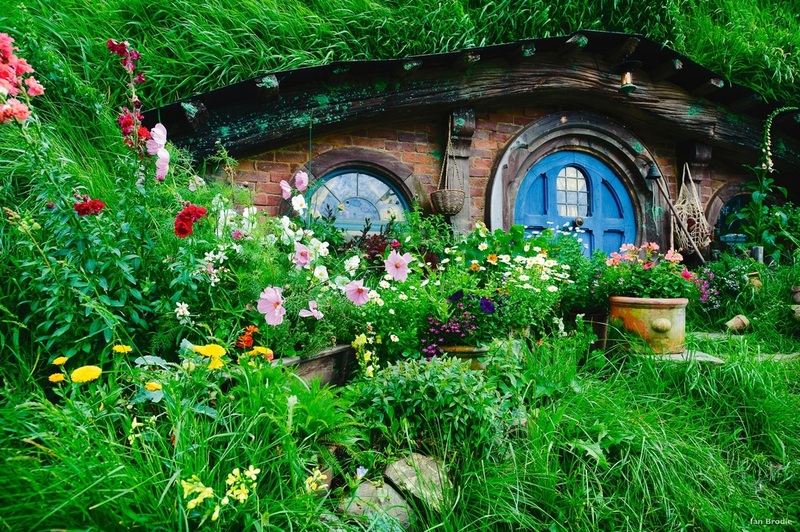 See the Hobbit Holes, take a farm tour and see a sheep shearing demonstration. Continue on to Rotorua. Rotorua’s striking gardens, cobbled streets and fascinating mix of Maori and English Tudor architecture give the city a significant point of difference. Beyond the urban centre, a backdrop of geothermal steam, volcanic mountains and huge crater lakes remind you that this region rests immediately above the Pacific Ring of Fire. Check into you Two Bedroom Canal Apartment at Marama Resort in Rotorua. MAORI CULTURAL EXPERIENCE AND HANGI FEAST! This evening gain an authentic introduction to Maori culture that will leave you amazed and in awe. See warriors in traditional dress paddle an ancient warrior canoe, witness a Maori Cultural Performance. Enjoy a traditionally cooked hangi meal. On June 10 1886, a violent and unexpected volcanic eruption shook New Zealand. For more than four terrifying hours, rocks, ash and boiling hot mud bombarded the peaceful village of Te Wairoa. 5000 square miles of scenic countryside were buried under hot heavy ash & mud. More than 150 lives were lost. The Museum of Te Wairoa tells the chronological story of lives, lives lost, events and effects of the 1886 eruption of Mt. Tarawera. Catch your flight to Christchurch to begin your South Island adventure! Welcome to Christchurch, the ‘Garden City’. The Southern Alps provide a fantastic backdrop to this awesome city. Perched on the coast, Christchurch is the doorway to the Canterbury Plains which spread westwards towards the mountains. Check into the Residence Suite at The George Hotel. Comfortably, spaciously appointed, and blissfully quiet, this luxury suite is for those who seek a peaceful sanctuary in a private setting. Today you will visit Akaora and go swimming with a pod of wild, curious Hectors Dolphins. The TranzAlpine scenic train is one of the world’s great train journeys. Travels from one coast of New Zealand to the other. From your carriage you’ll see the fields of the Canterbury Plains then climb into the Southern Alps before descending through lush beech rain forest to the West Coast town of Greymouth. Pick up your Premium 4WD and drive to Franz Josef. Check into your two bedroom unit at Punga Grove. Today you’ll take a hike on Franz Josef Glacier. Your guide will explain the unique features of the Franz Josef Glacier and its surroundings. After strapping on a set of Ice-Talonz you make your way up the terminal face of the glacier, exploring its lower reaches. Check into your two bedroom cottage at Millbrook Resort. Travel by coach and follow the shores of Lake Wakatipu and then through the countryside to Manapouri. Take a cruise across picturesque Lake Manapouri to West Arm before travelling by coach through dense rainforest across Wilmot Pass. On arrival in Doubtful Sound, board our spacious catamaran for a three-hour cruise through some of the fiord’s most stunning scenery. A specialist nature guide provides commentary, answers questions and points out highlights. Today you will enjoy a truly unique outdoor adventure safari. The journey begins with an exciting jetboat ride up the Dart River with all the thrills of shallow river jet boating and famous jet spins. You will be introduced to your Funyak - a unique inflatable canoe. You’ll paddle and drift with your guide downstream, taking in all the awe-inspiring sights amidst the Dart River channels. After navigating the river, you will be taken by 4WD coach to Glenorchy, stopping to view the stunning scenery that has inspired films the world over. Just a 5 minute walk from central Queenstown, ride the Skyline Gondola to the top of the Skyline complex. The best views in the region are found here spread out in a spectacular panorama - truly magnificent and awe-inspiring! Take a fun filled ride for all ages and abilities on 2 luge tracks situated behind the Skyline complex and accessed by chairlift or walking track. Experience the most dramatic scenery New Zealand has to offer. Helicopter to a secluded, remote mountain top where you’ll enjoy a leisurely picnic lunch and stunning alpine vistas. From the top of the world, relax and enjoy time in the wilderness before calling on the helicopter to return you to civilization. Your private transfer will pick you up from your hotel and take you to the Queenstown Airport for your flight back home.